If you're visiting Port Noarlunga South and trying to find somewhere to stay, you'll have a small list of hotels at your fingertips. Select any of the 4 within 5 kilometres of the town centre. Stay pretty close to the main hotspots at the Peppercorns Bed and Breakfast and Waterfront Port Noarlunga. Although it is 20 kilometres from the central area, Glenelg South is definitely worth considering. It has 3 available options to select from, Norfolk Motor Inn and Glenelg Holiday /corporate Accommodation. Stop to have a look at Onkaparinga River Wetlands and let the waters rush by as you take in the river's surrounds. Book your stay well in advance, because the only accommodation available within range of this site is Christies Beach Hotel. For some alternatives, try out the Adelaide Heritage Cottages & Apartments and the Buxton Manor. They are located 30 kilometres and 30 kilometres respectively from the center. Wotif also recommends the Seawall Apartments and the Fire Station Inn. The first is 20 kilometres away from town, while the other is 30 kilometres away. The greater Limestone Coast - Fleurieu Peninsula region is well worth spending some time in too. Check out the history museums. Outdoorsy types can also take in the region's beaches, rivers and lakes. Locals and visitors alike in this section of Australia often enjoy hiking. The nearby cities of Blewitt Springs and Aldinga are certainly worth checking out. Blewitt Springs is 11 kilometres to the east of Port Noarlunga South, while Aldinga is 11 kilometres to the south. Accommodations in Blewitt Springs are the A Vintners Luck and Chapel Hill Winery & Retreat. The Viking Farm Bed and Breakfast and Linger Longer Vineyard Bed and Breakfast are some of the better ones in Aldinga. Australians are some of the world's greatest sports lovers, so why not indulge with a visit to Hindmarsh Stadium? Find Hindmarsh Stadium to the north of Port Noarlunga South. Want to stay nearby? The Adelaide DressCircle Apartments - Sussex St and the Clarion Hotel Soho could both be perfect. Adelaide International Airport is located 25 kilometres away from the centre of Port Noarlunga South. Should you choose to stay nearby, you can easily secure a room at the Stamford Grand Adelaide or the Oaks Plaza Pier. How Much is a Hotel Room in Port Noarlunga South? 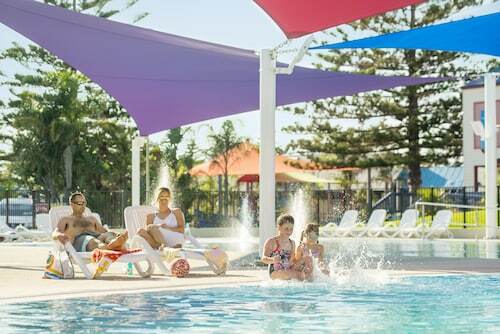 Hotels in Port Noarlunga South start at AU$113 per night. Prices and availability subject to change. Additional terms may apply.